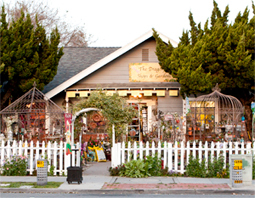 On any given day, the Dragonfly Shops and Gardens, a Victorian shop in the heart of old-town Orange specializing in collectibles, jewelry, and unique garden art, is a terrific place to visit. This coming Friday, April 20th from 6pm - 9pm, is an even better reason as the Dragonfly co-hosts a very special event with Cypress Church - an Ecuador Silent Auction. Admission is free! A bit of history: Five missionaries were killed, speared to death, by the Waodani tribe in 1956. Their story made international headlines, including Life Magazine. The Waodani were once called savages and considered the most violent of all tribes, but God’s love has and continues to transform them. See their story in a movie called, End of the Spear. Some of the most unique items to be sold include two, four foot-long blow guns (and darts) made by the Waodani tribe, plus jewelry, purses (called chigras), and plates, all made by the tribe. Other fantastic items to be auctioned include tickets to Magic Mountain, Medieval Times, Knott’s Berry Farm, Aquarium of the Pacific, and more; a stay at the Anaheim Doubletree Inn; Glen Ivy Spa gifts; meals at In-N-Out Burger, The Filling Station, Watson Drugs, and more; horseback riding; Wine Tasting and Making tours; exquisite jewelry; Waterford crystal; and much much more - something for everyone! There will also be a make-it-and-take-it craft to do for all ages. Bring the family and join the fun while supporting a worthy cause this Friday, April 20 at 260 N. Glassell Street.